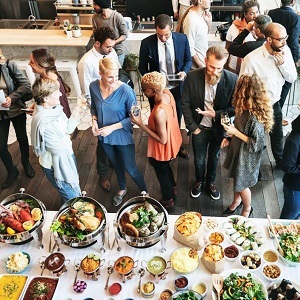 Changing demographics, food costs, health concerns and a desire for a sense of place are leading to shifts in food and beverage offerings for groups and events. At the 2016 opening gala for the Centrallia Global B2B Forum in Winnipeg last May, Jonathan Strauss, president of Strauss Event & Association Management, based in Winnipeg, made sure that the city’s hometown flavours were on the menu at the RBC Convention Centre. Global entrepreneurs feasted on a wide variety of local ingredients, including flambéed pickerel cheeks in a Pernod sauce and grilled home-style buffalo sliders. “Local berries and Manitoba pork, fish and buffalo gave attendees a true taste of the flavours of the city,” says Strauss. Both Shehata and Strauss say that healthy break menus are more in demand than the usual danish and croissant combos. Yogurt, fruit smoothies served in shot glasses, fruit skewers and water—flavoured with fruits and vegetables—are replacing sugary drinks and coffees.